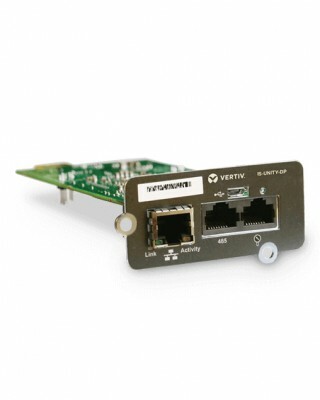 Liebert IntelliSlot Unity Communications Interface Card provides Trellis, LIFE Services and Liebert Nform enablement as well as Web access, environmental sensor data, and third-party customer protocols for Vertiv equipment. The cards can monitor and manage a wide range of operating parameters, alarms and notifications. Provides Web access, environmental sensor data, alarm notifications, and third-party interface protocols for Vertiv equipment, and integrates with Vertiv LIFE Services, Trellis, and Liebert Nform.